Last year my children treated me to a shopping spree in Half Price Books for Mother's Day. I cleared out almost the whole crochet shelf. 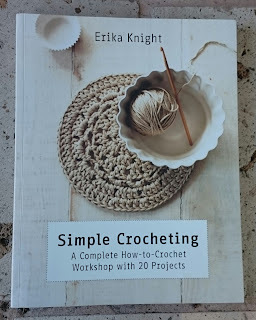 One of the titles that I selected on sight was "Simple Crocheting" by Erica Knight, bought because I'd seen a copy at the yarn store where I work. 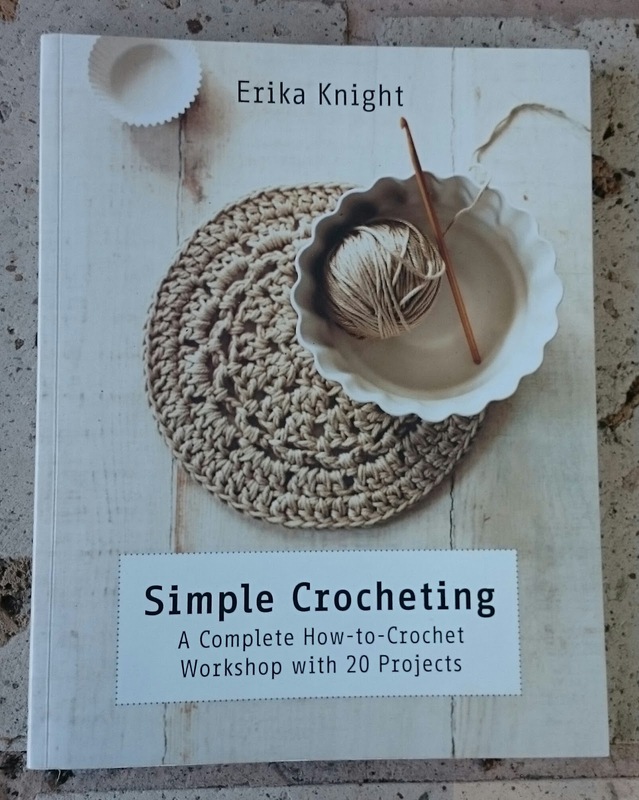 The books there are carefully curated and there aren't many on crochet so I knew it had to be worth buying. This year I heard Fay and Lynne from the Crochet Circle podcast interview Erika Knight, their "icon", followed by Vickie Howell interviewing Erika for her Craft-ish series and realized just how famous and talented Erika is. It was time to have a look at that book that was sitting on my bookshelf still unopened. I hadn't even realized Erika was British like me! The book, written for complete beginners, has three main sections: Materials and Techniques, Stitch Library and Project Workshops. There is a fantastic personal narrative running through the book giving advice and tips from Erika herself. I particularly like the pages on controlling the yarn in the technique section by the Index Finger or Middle Finger method and the note on tensioning the tail. I will use this information for my students. The choice of stitches to put in the stitch library is pure genius. I own a number of stitch dictionary books containing hundreds of possible stitch patterns to choose from but Erika has picked her favorites (and they are fantastic) and then given examples of the types of yarn and projects that suits the specific stitch pattern. There are twenty wonderful projects in the final section varying in difficulty. The color choices for the projects are fantastic. I'm sure everyone would find several projects that they would like to make. I made a modified version of the fingerless mittens for my sister in law as a Christmas gift in festive red. That's the thing with stitch dictionaries - you get the stitch instruction and that's all. 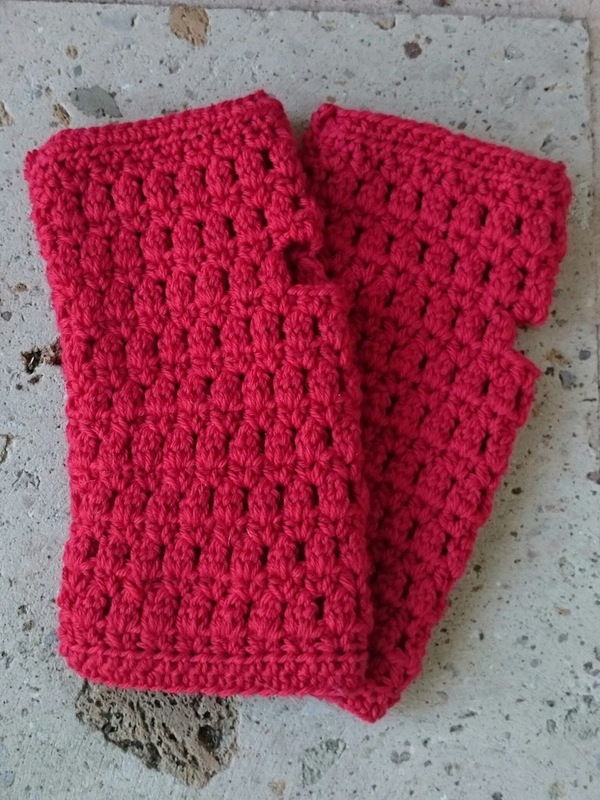 How useful for crocheters to have some advice about the practicalities of the pattern before they have to find out for themselves for better or for worse. I'm interested to know about the middle finger vs index finger debate. I use my middle finger for tension control and my pinky finger to draw up the yarn from the ball as I work. How about you? I had to get my yarn and hook out to see which I am.... I didn't realize there was a debate. Ha ha! I remember when I used to crochet my mother in law, who is a stickler for details, told me I was holding my yarn like a knitter not a crocheter so I purposely taught myself the "correct" way. When I teach I tell people to just tension it how it feels most comfortable for them. I am an anything goes kind of gal! OK I tension the yarn between my ring and little finger and maneuver it with my index finger. It sounds quite different from you Jodie, the opposite way around. That's amusing.